Interview with lesbian fiction author Cara Malone and a free book! This week’s interview guest is Cara Malone, a lesfic-loving indie author whose work includes bestselling medical romance The Origins of Heartbreak. 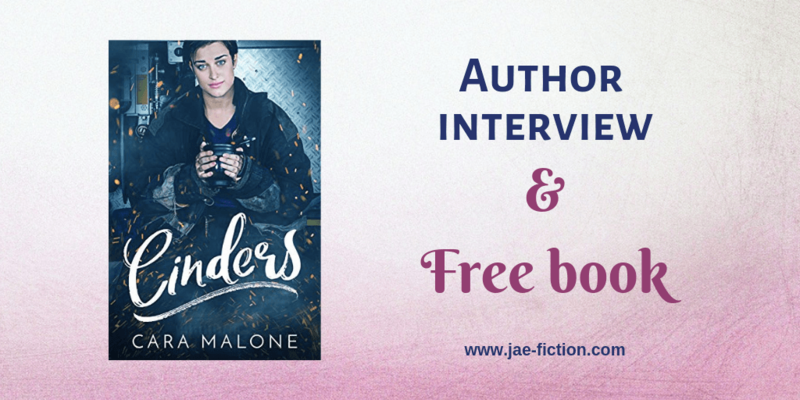 Today, Cara has a wonderful surprise for you readers: She’s offering the ebook version of her contemporary fairy tale Cinders for free. It won’t stay free forever, though, so if you want your own copy, go ahead and download it from Amazon right away—and read on to find out more about the book and Cara’s other work. Please tell us a little about Cinders, the book you are offering for free today. It’s a modern retelling of Cinderella in which the title character, Cyn, is a firefighter and her dream girl, Marigold, is a socialite who barely knows she exists. When an arsonist sets Marigold’s prized garden on fire, Cyn comes to the rescue. The two of them join forces to find the firebug and the…ahem…sparks fly. Cinders is a modern, lesbian adaption of Cinderella, and you also gave the Red Riding Hood story a new spin in Seeing Red. What’s the appeal of fairy tales for you? I think the Disney versions are something that a lot of us grew up on so they’re familiar, but maybe not so relatable. I wanted to flip the “handsome prince” character for lesfic readers, and I also badly wanted to get rid of the “damsel in distress” trope in favor of strong female characters. Cyn, the main character of Cinders, is a firefighter. How did you come up with that idea? I started with the original fairy tale—Cinderella is a nickname given by her stepmother because she’s forced to sleep in the ashes of the fireplace to keep warm. I wanted to keep the connection to fire, but give the character a lot more power over her situation. The Rulebook series (beginning with The Rules of Love) grabbed people in a way that I wasn’t expecting when I wrote it. I have a number of friends and one past partner on the autism spectrum, but I myself am not, so I was nervous about doing justice to a character like Max. The response to her was overwhelmingly positive and Ruby and Max are some of my most-beloved characters—both personally and among my readers. You write a series of medical romance novels. What kind of research did you have to do for the Lakeside Hospital series? Lucky for me, both of my parents are in medicine and I’ve been able to ask them lots of questions. My dad worked for the coroner’s office for many years, and I’ve actually gotten to observe autopsies, which inspired the meet cute in The Origins of Heartbreak. My mom helped a lot with the details in Labor of Love since she was a pediatric nurse. For the education details, I did a lot of lurking on medical school forums! Raven, the main character of your romance Trail Magic, is a cancer survivor. What kind of feedback did you get for that from readers? A lot of women reached out to tell me how the book resonated with their own experiences with breast cancer or that of their loved ones. I am always honored to hear when readers are able to relate to my characters, especially with such a personal and difficult subject. I really wanted Raven to be a strong, inspiring character. What was the last TV show you binge-watched? I just discovered Shark Tank even though it’s been on for a decade. It appeals to the part of my brain that’s always looking for million-dollar ideas but never has the time to execute them—letting someone else do the work while I sit on the couch with my bunnies and watch is the best of both worlds. If you were a cookie, what kind would you be and why? Gosh, this shouldn’t be as hard as it is! I guess I’ll go with fortune cookie since this question feels like a test—simple on the outside, a hard one to crack, with more on the inside than meets the eye. There—the armchair psychologists who are reading can have fun with that! Do you have time to read? Any favorite lesfic or f/f books you can recommend? I always make time to read—audiobooks are a lifesaver because I can multitask while I’m reading. Some of my favorite lesfic reads are As Long as Love Lasts by Jea Hawkins, The Chosen One by TB Markinson, and Close Enough to Touch by Cade Brogan. When’s your next book coming out, and what are you working on right now? My next book is the latest Sapphic Fairy Tale, Fairest, coming in April. It’s a contemporary retelling of Snow White, and holy cow, did I ever underestimate how hard it would be to write such a large cast with Snow White’s love interest and her six overprotective, slightly jealous brothers. It’s been a lot of fun, though! Where can your readers find out more about you and your books? I hang out in the Lesfic Slack chat pretty much every day; I’m on Twitter, Facebook, and BookBub @CaraMaloneBooks, and readers can find my reading order and other book details on my website at www.caramalone.com. Thanks for having me, Jae! There’ll be a new author interview and another free book for you to download in two weeks. Either check back or subscribe to my blog so you won’t miss it. Thanks for the interesting interview and thanks to Cara Malone for the free book! I enjoyed The Rules of Love and I look forward to reading this one. Thank you Cara Malone for the free book. I haven’t read any of her books yet. Look forward to reading Cinders. Ooh those descriptions of the modern reworkings of the fairytales sound rather scrumptious. I love Cara’s books, and this one sounds brilliant. Love strong women in stories! I really enjoy stories with female firefighters! Thank you for writing such good stories Cara! I purchased and read Cinders last year in March. It was brilliant! Thank you for the interview, very enlightening. I am off to go and look for Seeing Red. I have yet to read any of your work, honestly. Life is hard and I don’t have a lot of money to work with, especially after Mom’s cancer and my major surgery last year. But I’ve had the featured book above on my WL on Amazon for some time and have waited for a while for it. I can’t wait to read it and more of your works! Great interview and thank you for the free book. Looking forward to reading a new to me author. My tbr stack just keeps getting taller and I think it’s mainly your fault Jae! But I’m loving every minute of it 🤓🤓. So thanks for these interviews.